"I never wanted to be a poster boy for academic freedom. You can't give an inch. If you let this one down, you've lost it all." Protesters made their opinions known last night outside the entrance of the auditorium where University of Colorado professor Ward Churchill delivered his speech on the University of Hawaii at Manoa campus. Ward Churchill, the outspoken Colorado professor who created a national uproar by comparing 9/11 victims to Nazis, told an overflow crowd at the University of Hawaii last night that he is the target of a right-wing strategy to attack academia. 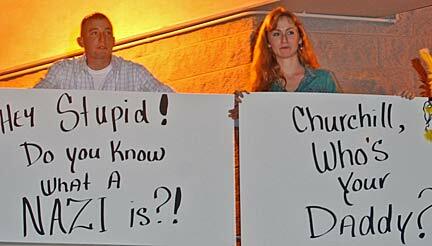 University of Colorado professor Ward Churchill drew about 800 people to his speech at UH-Manoa last night -- plus a dozen protesters like these. He said the theme of his essay and a later book was that the United States has been involved in violating international law and killing innocents and should not be surprised that some people would want to kill Americans -- the "chickens coming home to roost," as his essay is titled. The Honolulu Star-Bulletin, incorrectly quoted University of Colorado professor Ward Churchill as admitting that he was not American Indian. The story about Churchill's Tuesday night speech at the University of Hawaii-Manoa said the professor noted that his "white Republican" critics were asking, "Is he an Indian? Do we really care?" "Let's cut to the chase, I'm not," the quote in yesterday's paper continued. But a review of video and audio tapes of the speech shows that Churchill actually said: "Is he an Indian? "We really care. We're trying to protect the rights of Indians to divine for themselves, say this circle of flies in the form of white reporters circling a manure pile like it's of all consequential importance. "Cut to the chase on that." Churchill went on to say that he is an associate member of the Keetoowah tribe and that associates are enrolled in the band after their genealogy has been vetted by the enrollment office. He said that he is less than one-quarter Indian, so he does not qualify to be a full member. The issue of whether Churchill has Indian blood is part of the national debate over the controversial professor who gained notoriety for comparing some Sept. 11, 2001, victims to Nazis. He argued that the World Trade Center could be considered a legitimate target because it is a symbol of the financial power that allows the United States to flex its military might. DENVER » University of Colorado President Elizabeth Hoffman warned lawmakers yesterday against rushing to punish a professor who likened some Sept. 11, 2001, victims to Nazis, saying a misstep could land the university in court and make the embattled teacher "a very wealthy man at our expense." Furious lawmakers threatened to take state funding away from the university over an essay by Ward Churchill, a tenured professor of ethnic studies, who wrote that some "technocrats" killed in the World Trade Center were like Adolf Eichman, who orchestrated the Nazi holocaust. Gov. Bill Owens has said Churchill should be fired, but Hoffman told a caucus of Republican legislators that the professor's future has to be handled the right way. "If we approach this issue wrong, not only will every regent be sued personally, but every administrator will be sued personally and professor Churchill will win his lawsuit with triple damages and be back on the faculty, a very wealthy man at our expense," Hoffman said. The university has launched a review of Churchill's writings and speeches to see if he overstepped academic freedom and should be dismissed. But Hoffman said public debate about firing him only clouds the issue. "The more talk there is about the need to fire him, the more difficult it becomes for us to do that, if that's what we decide to do," she said. Republican Sen. Doug Lamborn of Colorado Springs, who introduced a resolution last week urging the university to fire Churchill, did not return a message. Lamborn said he had been meeting with regents to discuss the resolution because he wanted to avoid any "unintended consequences." Hoffman said the law protects public employees' right to free speech, "no matter how odious it might be." Some members of the Board of Regents have suggested reviewing the university's policy of granting tenure, essentially a lifelong appointment. Owens has said lawmakers might want to consider setting statewide standards for when tenure is granted, instead of leaving it to universities. Hoffman told lawmakers that tampering with tenure would be a mistake that could drive away other faculty members and make it difficult to hire new ones. 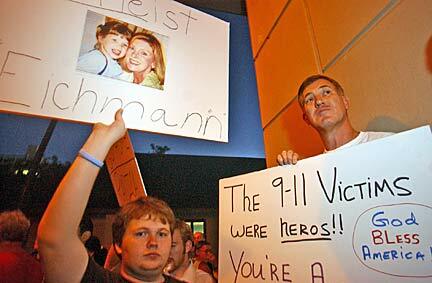 "They need to know we have not engaged in a witch hunt," Hoffman said. "We're taking a careful and measured approach." » Kirsten Chong, a University of Hawaii student, was misquoted as saying that Colorado professor Ward Churchill was "humorous" and didn't pull "any punches," and that she agreed with much of what Churchill said. She said only that because she is native Hawaiian, she agrees with some of what he said.